(ArmsVault.com) – It is a .45 capturing the essence of America. The strikingly rugged “We The People” 1911 from SIG SAUER is a combat tool, fashion statement and patriotic declaration all in comparable measure. The full-size, steel-framed pistol takes the commanding lead in the March/April issue of American Handgunner. The high-end 1911 pistol features a custom-aged finish in distressed steel, cast aluminum grips with 50 stars and “1776” in stylized script on the slide — and it performs as well as it looks. Will Dabbs, MD, recounts the history of the 1911, SIG’s success in adapting it over the years and the patriotic perfection showcased on the limited edition “We The People” model. “The controls are perfect, and the mechanics superlative. In SIG’s case, they touch upon the very essence of what it means to be an American. When facing a common foe, We the People stand ever strong, united and unbreakable. And SIG has made a 1911 for us that captures this spirit,” he declares. This month’s “Tactics & Training” column addresses an important question about selecting a back-up gun: should it be a primary or secondary gun? Or both? It should be one you are willing to bring to a gunfight because when you reach for it, you will be in a gunfight, and your back-up gun must get it done. Insightful information from John McCarthy will help readers find the answer. Additional highlights in the March/April issue include what’s new, updated and eye-catching in handguns in the “A Close Look” feature. 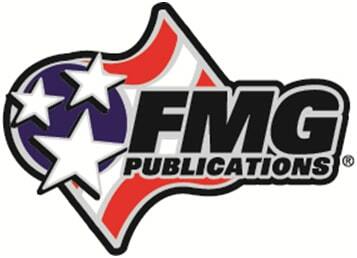 John Taffin discusses the return of the combat magnum in “The Sixgunner” installment. And the “Ayoob Files” shares the heroic story of Brian Murphy, mass-shooting survivor and retired police lieutenant. The 10mm continues to make its formidable presence known. Topping the list of prizes for this issue’s Handgun Of The Month giveaway is a Les Baer Custom Premier II 6″ Hunter. Designed specifically for precision hunting, the hard-hitting 10mm boasts steel components for a distinguished look. 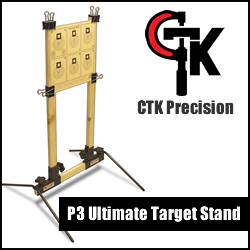 Features include a low mount adjustable sight, fiber optic front sight and 4lb. trigger pull. The winner will also receive Silencer Ear Buds, a Dark Energy flashlight and Spec Arc knife from SOG Specialty Knives & Tools and a 2-pack of G96 Synthetic Gun Oil. Altogether, the items in the giveaway total $3,492.20. 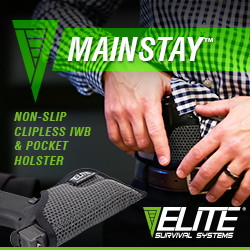 Readers are invited to enter for free by visiting www.americanhandgunner.com/giveaway. 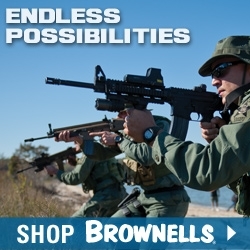 American Handgunner offers more by way of exclusive content available online-only. This month’s features include “Documenting Your Gun Collection” and “Without The Human Hand” — accuracy testing using a wooden barrel clamp – can it work? 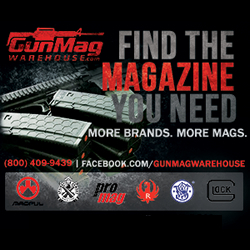 Visit www.americanhandgunner.com/digital-version to access exclusive web content and previous issues of American Handgunner. The March/April issue can be purchased and downloaded as a PDF. Kindle and digital versions are also available. 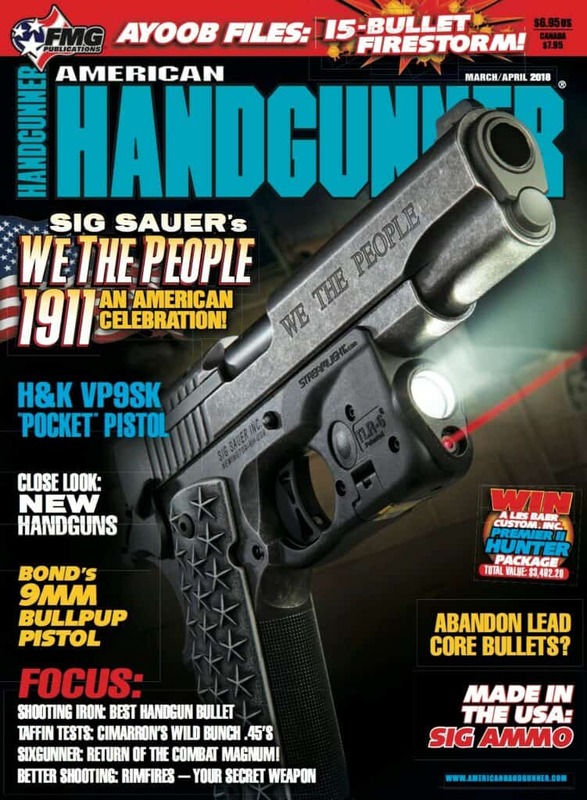 FMG Publications will be distributing free copies of this issue of Handgunner — along with the March 2018 issue of GUNS Magazine and Shooting Industry’s Dec. 2017 and Jan. 2018 New Business Year editions — from booth #16327 at SHOT Show, January 23­–26 at the Sands Expo and Convention Center in Las Vegas.